San Francisco (Obama.net)- After months of campaigning and mudslinging, the Midterm Elections of 2010 are now winding down. With results still trickling in from all parts of the United States, the magic numbers have been met and we now know who won the Senate and the House of Representatives. Despite losing six Senate seats as of yet, the Democrats will walk away tonight with at least 51 of the Senates seats, exactly what they needed to maintain control. The Republicans currently sit at 46 seats with 3 seats yet to be determined. While it is now clear who will control the United States Senate, the remaining seats are still of value. With their gained seats in the Senate, the Republicans can now make it harder for President Obama and the Democrats to get legislation passed. The remaining three seats would either make it a little easier on the Democrats to pass bills or make it even less of a challenge to block bills for the Republicans. The Democrats were not as lucky in the House of Representatives. Coming into Election Day, Democrats had 256 seats in the House while the Republicans had 179. But with polls closed and the final results still coming in, Democrats have no chance to keep the majority as the Republicans have already taken it by surpassing the 218 needed seats. 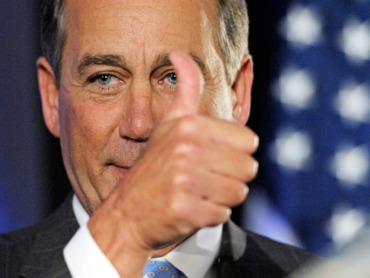 As a result, John Boehner of Ohio is now the new Speaker of the House. Just like with the remaining seats up for grabs in the Senate, the Democrats can hope to take some of the seats in order to have a better chance of passing Obama’s legislation and standing up to Republicans filibusters and blockades. In the races for Governor throughout the country, of the states with reported results, Republicans have overtaken ten states. Democrats did, however, take over California with the victory of Jerry Brown over Meg Whitman. Also, Rhode Island went to Independent Lincoln Chafee. After much campaigning by President Obama and his colleagues, one would expect that disappointment might be the feeling in the White House. However, President Obama has been dealing the political games of the Republicans for months. Now the wait and see is on. Will the Republicans introduce previously unmentioned new ideas to improve the country or will they simple try to reinstate the former Bush policies? Will Obama be able to continue to rebuild the American economy, job market, and housing market or will the Republicans constant partisanship and blockade attempts prove to be too much with their increase presence in Congress?